Krave, opened by Lenny Mihailov nearly five years ago, has quickly become one of our favorite lunch spots in Astoria. Located conveniently on Ditmars, Krave serves up a huge variety of food at pretty competitive prices. Lenny tells us, “We wanted to give good, healthy, clean food to the neighborhood. We got tired of everything else that’s around, so we wanted to serve us something different,” and that’s just what they did. Now, there’s one aspect to Krave that’s both really awesome, and really intimidating for someone as indecisive as me – their menu is HUGE. Seriously guys, this thing is massive. This is awesome because you could probably go to Krave every day for a year and not try the same thing, but you could also be like me and spend three hours stuck deciding between a tuna melt, a burger, a salad, a quesadilla, an omelet….you get where I’m going with this. You’re probably thinking “Well if they don’t have a specialty, they can’t possibly be good,” but the thing about Krave is that none of their food is extravagant, or cooked with a million secret ingredients – it’s straightforward. The food here is classic and accesible, and it’s great for going with groups of friends that all have completely different tastes. A lot of the food leans towards the healthier side of cooking. There’s 15 different types of salads, and everything is grilled. The dressing here is homemade and absolutely to die for – and especially good because it’s low fat and low sodium. There’s also 15 types of paninis, and 15 types of wraps. The burgers at Krave are only made with fresh meat from International Meat Market – which you guys already know we love. There’s also an amazing roast skirt steak, and if you’re not in a meaty mood, we recommend the grilled shrimp. Krave has a great selection of drinks – we counted 25 different types of beers. And of course, they wouldn’t be an Astoria eatery without offering weekend brunch. 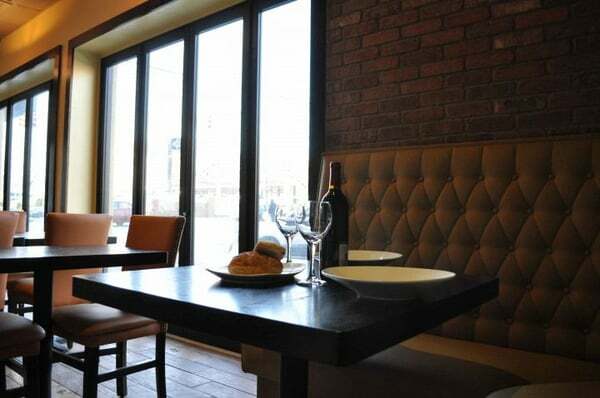 On the weekend they open up the doors, and the cozy bricks walls and leather chairs become even more inviting. And of course, you get up to 5 mimosas – because you always need mimosas with brunch. Our Pick of the Week is Krave Cafe and Grill because they offer us a whole lot of choices – even if some of us are slightly intimidated by too many choices. Their healthy offerings never lack in taste, and that’s something we’re really big on. The decor and interior gets high scores from us as well – it’s very open and inviting, and overall, we regularly find ourselves visiting and enjoying. Previous articleGetting to know Frances L. McDonald! Next articleLocal Project is Saved!